The cichlid family includes many colorful, fascinating fish. 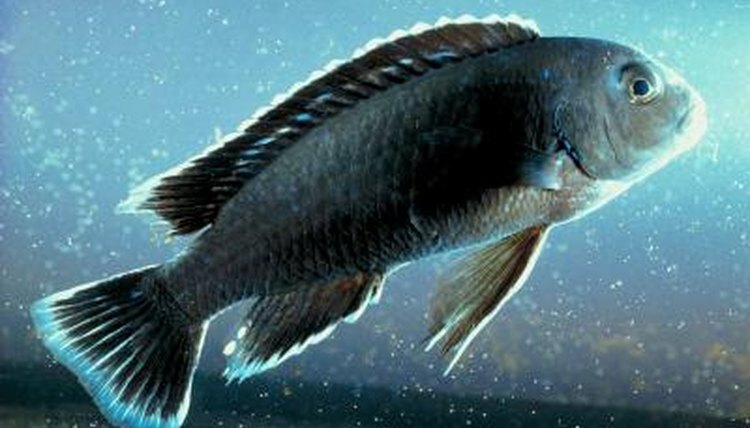 Unfortunately, this family is also known for aggression and fighting, both among themselves and other species of fish. However, almost all cichlids can tolerate certain other fish under the right circumstances. To avoid casualties, carefully select your tankmates. Even among cichlids, African cichlids are known for their aggression. When a person says "African cichlid," it's understood to mean cichlids from the Rift Valley region in Africa. Despite their aggression, most will tolerate several different kinds of catfish. This includes larger species of Rafael catfish, plecos and Synodontis catfish (including the upside-down catfish). You can also include various rainbowfish in an African cichlid tank. Rainbowfish swim in the upper levels of an aquarium and distract aggressive cichlids from beating on each other. However, avoid keeping smaller rainbowfish with larger, predatory African cichlids. In many ways, dwarf cichlids are the opposite of African cichlids. They stay small, and they get along with most fish. This includes South American cichlids like the ram and checkerboard dwarf cichlid, and certain African river cichlids like the krib. These fish will generally get along with any fish that doesn't pick on or bully them. They get along well with most species of tetra. Corydoras catfish also make great tankmates. Smaller species of pleco can also comfortably share a tank with dwarf cichlids. Keep in mind that many dwarf cichlids require soft, acidic water, and any tankmate needs to tolerate this as well. The freshwater angelfish (Pterophyllum spp.) and the discusfish are two slightly larger South American cichlids, growing to 6 to 8 inches. Like the dwarf cichlids, they are generally peaceful, sometimes to the point of shyness. However, they will eat smaller fish like small tetras and cory catfish. In light of this, only keep them with larger, peaceful fish like hoplo catfish -- larger relatives of the cory catfish and larger tetras. They can also share a tank with medium-sized plecos, like the bristlenose and clown pleco. Avoid aggressive and large plecos, which can bully these cichlids. Central American cichlids are generally aggressive. But there are still fish that can share a tank with them. Fast-moving school fish like the Mexican tetra can act as dither fish. Just like with African cichlids, rainbowfish also work as dither fish. Like most other cichlids, they will tolerate the presence of plecos, even aggressive plecos like the blue-eyed panque.